Africa Rising, Sakata and Eastern Cape Department of Rural Development and Agrarian Reform partner to promote sustainable development and food security. This year Africa Rising Foundation held a three day celebration leading up to Mandela Day on July 18, 2016, with a range of community projects in Qunu, the home of Nelson Mandela. Founded by Nelson Mandela’s grandsons Ndaba and Kweku Mandela, Africa Rising focuses on inspiring a new generation of youth who believe in and work towards an empowered Africa. This year marks their second Nelson Mandela Day Initiative, joining the global call to action for doing good on Nelson Mandela Day and beyond. The weekend’s activities kicked off with the launch of Mandela’s Community Gardens on Thursday, 14 July. In partnership with the Department of Rural Development and Agrarian Reform and seed company, Sakata, Africa Rising launched a drive to distribute one million seeds to one million household farmers over the next year. 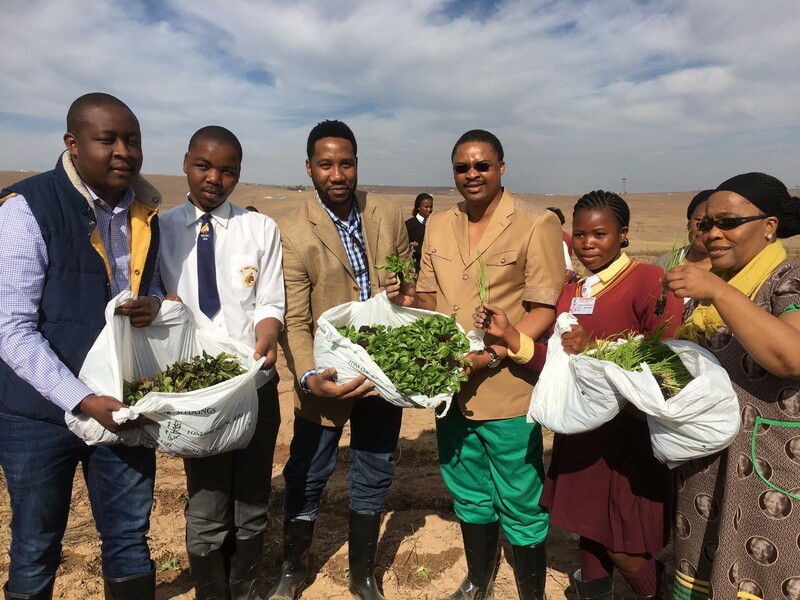 The initiative promotes sustainable development and food security by giving farmers vegetable seeds to grow their own food in line with the Eastern Cape’s plans to address food security and production concerns in the region. In addition to seed distribution, 67 plots of land have been made available on Madiba’s farm in Qunu, for companies to sponsor a child in the Qunu/ Umtata area. Children can plant vegetables and access their plot anytime until harvest time. They can also keep the produce for their families to consume or sell and share to other households and people from surrounding communities. “It is important for us that the 67 children chosen are from this very community so it’s easy for them to commute and take part in the development of their plots from seed to harvest”, said Ndaba Mandela. The plots are sponsored at R10,000 each with half of the funds dedicated to the child’s education and the other half utilized on the farm to ensure all the necessary resources are available to farm the plots. All the plots are entered into a competition and at harvest time the plot with biggest yield and best quality vegetables will win a prize. Through this project the youth can play a part in curbing food inflation, contribute to a reliable source of food security for themselves and their immediate community, as well as save money which can be spent on other needs. In addition to addressing these challenges, Ndaba has high hopes for this project and it’s immediate benefits in the community, particularly for the youth. “A lot of the time kids don’t have anything to do, in Johannesburg there are a lot more facilities and activities for children to immerse themselves in after school, whether it be sport, whether it be music. In the Eastern Cape there aren’t as many options so we’re encouraging the children to spend time in their gardens, cultivating their produce, learning about agriculture and keeping them away from activities of a more harmful nature”, says Ndaba. This initiative focuses on getting the youth involved in agricultural activities to empower themselves and make a difference in the community while making a positive impact on food security in the area. “It’s really inline with the spirit of Nelson Mandela to make sure that young people get involved in doing agricultural work. Once this project is successful we shall try and add other elements like worm farming and cattle farming to the gardens to create an ecosystem that produces enough for the community to start selling to distributors,” comments Ndaba on the project’s future plans. “Community Gardens play a key role in organising a community to be able to produce everything that they consume, therefore being truly sustainable, saving money and living a more healthy lifestyle. We encourage other provinces and countries to establish similar community initiatives to combat food inflation on a larger scale,” Ndaba adds. Paul Ntshabele of Sakata; Siviwe Mponzo a St John’s College student; Ndaba Mandela of Africa Rising Foundation; Rural Development and Agrarian Reform MEC, Mlibo Qoboshiyane; Nangamso Phuthumani of Milton Mbekela; and KSD Mayor, Councillor Nonkoliso Ngqongwa showing off some of the vegetables seeds planted in 67 plots at Nelson Mandela’s farm in Qunu as part of Nelson Mandela Day. Africa Rising is a conduit for the New African Generation. Africa Rising is committed to publicising the positive image of Africa in order to instill a sense of pride and purpose in young Africans. Africa Rising is the voice of the African youth worldwide who believe in themselves and their continent and act on this to build a prosperous Africa. Sakata Seed Southern Africa’s Seeds (Pty) Ltd grew out of C May & Co which was founded in 1931. Over the years the company developed a diverse portfolio including seed production, packet seed, vegetable, forage, turf and flower seed, vegetable breeding programs and specialised products for the home garden industry. Trial grounds were acquired in 1947 outside Johannesburg, with plant breeding having been started in 1965. 1973 saw the introduction of the revolutionary and very successful hermetically sealed garden seed packets. A decade later, and an important milestone, Sakata Seed Southern Africa’s’s highly sophisticated seed laboratory was officially recognised as a government approved seed testing station. In the middle of the 80’s the company transformed its distribution into a franchising operation.Today the company is operating with 7 national franchisees and various international francisees throughout Southern Africa with a franchisor complement of 80. In December 1999, the Sakata Seed Corporation of Yokohama, Japan, acquired Sakata Seed Southern Africa’s Seeds (Pty) Ltd. Sakata is one of the largest seed companies in the world with extensive global research programs in vegetable and flower seed. The mission of the Eastern Cape Department of Rural Development and Agrarian Reform is to promote, support and coordinate rural development and agrarian reform to reduce poverty and underdevelopment through integrated and participatory interventions. The three strategic goals of the Department are: a thriving farming sector and access to affordable food; improved rural economic livelihoods and creation of employment opportunities; and an environment conducive to the enhancement of service delivery. These strategic goals have been identified to reflect critical service delivery priorities. They are intended to ensure that the mission of the Department is achieved; provide a line of sight in the process to achieve the overall mandate of the Department, which is to enhance rural development, land and agrarian reform, and food security; and inspire a cadre of officials and stakeholders to strive to achieve these for the benefit of the rural poor and vulnerable.